Original Sacred Harp: Centennial Edition. 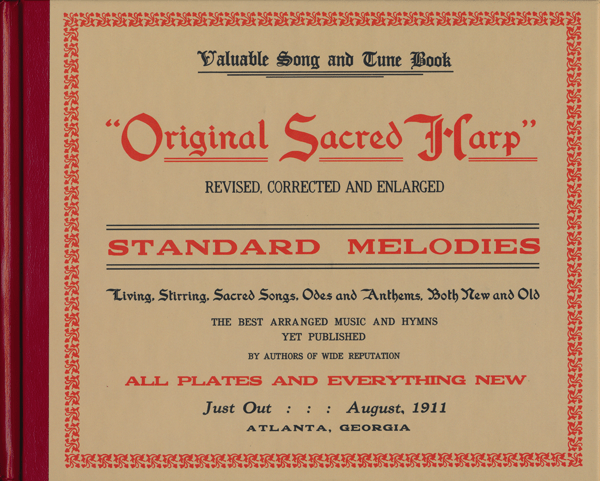 Joseph Stephen James, ed., Original Sacred Harp: Centennial Edition, Centennial Edition ed., Jesse P. Karlsberg (Atlanta, GA: Pitts Theology Library; Carrollton, GA: Sacred Harp Publishing Company, 2015 ). Amy Kiley, “Shape-note Singers Revive the 1911 Sacred Harp,” WABE [Atlanta’s NPR station], March 2, 2015. Jesse P. Karlsberg, “Old Strings on a New Harp,” Sacred Harp Publishing Company Newsletter 4, no. 1 (May 28, 2015). “Folklore’s Filter: Race, Place, and Sacred Harp Singing” (Ph.D. dissertation, Emory University, 2015), http://pid.emory.edu/ark:/25593/pgtds. Honorable Mention, Wiley Housewright Dissertation Award, Society for American Music. Finalist, Allan Nevins Dissertation Prize, Society of American Historians. Phillip Lutz, “A Different Note on Race at Yale,” New York Times, January 2, 2016. “Ireland’s First Sacred Harp Convention: ‘To Meet To Part No More,’” Southern Spaces, November 30, 2011, http://southernspaces.org/2011/irelands-first-sacred-harp-convention-meet-part-no-more. Sounding Spirit: Critical Editions from the Southern Sacred Music Diaspora, 1850–1925. Series of digital and print critical editions. Series editor-in-chief. University of North Carolina Press. The Sacred Harp. Shape-note tunebook in print since 1844. Revision committee member, with David Ivey, Lauren Bock, Helen Brown, Richard Ivey, Nathan Rees, Karen Rollins, Terry Wootten, and David Wright. Sacred Harp Publishing Company. Toward a Critically Engaged Digital Practice: American Studies and the Digital Humanities. Special issue of American Quarterly 70, no. 3 (2018). Co-editor, with Matthew Delmont, Amy Earhart, Susan Garfinkel, Angel David Nieves, and Lauren Tilton. “Southern Spaces: A Partial History,” Southern Spaces, September 28, 2017 (with Martin Halbert, Katherine Skinner, Allen Tullos, Sarah Toton, Franky Abbott, Katie Rawson, Meredith Doster, Mary Battle, and Sarah Melton). “Raymond Cooper Hamrick: Sacred Harp Craftsman,” Georgia Music News 72, no. 2 (Winter 2011): 74–76. “Mapping the ‘Big Minutes’: Visualizing Sacred Harp’s Geographic Coalescence and Expansion, 1995–2014,” Southern Spaces Blog, January 23, 2018 (with Robert A. W. Dunn). “Renewing Multimedia Scholarly Publishing: A Streamlined and Mobile-Friendly Design for Southern Spaces,” Southern Spaces Blog, August 19, 2015. “Readership Reports and the Benefits of Open Access Publishing,” Southern Spaces Blog, November 13, 2013 (with Sarah Melton and Alan G. Pike). “Sacred Harp, ‘Poland Style,’” Southern Spaces Blog, February 27, 2013. “Place and Pluralism: The ‘Georgia Harmonies’ Traveling Exhibition,” Southern Spaces Blog, June 5, 2012. “Singing Across the Color Line: Reflections on The Colored Sacred Harp,” Country Dance and Song Society News (Summer 2016): 14–17. “‘Come Sound His Praise Abroad’: Sacred Harp Singing across Europe,” Country Dance and Song Society News (Winter 2012–2013): 9–12. “Orin Adolphus Parris: At Home Across the Shape-Note Music Spectrum,” Sacred Harp Publishing Company Newsletter 6, no. 1 (September 1, 2017). “Raymond C. Hamrick’s Contributions to Sacred Harp Singing and Scholarship,” Sacred Harp Publishing Company Newsletter 5, no. 2 (December 31, 2016). “Regional Roots: Growing Sacred Harp in the Netherlands, Alaska, and British Columbia,” Sacred Harp Publishing Company Newsletter 4, no. 2 (December 31, 2015). “Seasonal Songs,” Sacred Harp Publishing Company Newsletter 4, no. 2 (December 31, 2015), (with Mark T. Godfrey). “Old Strings on a New Harp,” Sacred Harp Publishing Company Newsletter 4, no. 1 (May 28, 2015). “Elphrey Heritage: Northern Contributor to the Nineteenth-century Sacred Harp,” Sacred Harp Publishing Company Newsletter 3, no. 2 (November 11, 2014), (with Christopher Sawula). “A Brief History of A Brief History of the Sacred Harp,” Sacred Harp Publishing Company Newsletter 3, no. 2 (November 11, 2014). “The Cold Mountain Bump: Hollywood’s Effect on Sacred Harp Songs and Singers,” Sacred Harp Publishing Company Newsletter 2, no. 3 (December 31, 2013), (with Mark T. Godfrey and Nathan Rees). “Bruce Springsteen’s Sacred Harp Sample,” Sacred Harp Publishing Company Newsletter 1, no. 1 (March 28, 2012), (with John Plunkett). “Douglasville” and “Wilscot,” in Myles Louis Dakan, John W. DelRe, Leyland W. DelRe, Nora Dunn, Rachel Wells Hall, Daniel Hunter, Kelly Macklin, and Robert Stoddard, eds., The Shenandoah Harmony (Berryville, VA: Shenandoah Harmony Publishing Company, 2013), 142, 434–435. “National Blessings,” in Johnny Lee and Karen Willard, eds., The Sacred Harp: Revised Cooper Edition (Samson, AL: Sacred Harp Book Company, 2012), 594. “Clinton,” “Hamrick,” and “Newton,” in Larry Gordon, Anthony Barrand, and Carole Moody Compton, eds., Northern Harmony (Marshfield, VT: Northern Harmony Publishing Company, 2012), 46–47, 104, 178–179. “Waddell Street,” The Trumpet 4, no. 2 (December 2014): 178. “Anniston,” The Trumpet 3, no. 3 (November 2013): 148. “Farewell Brethren,” The Trumpet 3, no. 3 (November 2013): 148. “Akerman,” The Trumpet 3, no. 1 (February 2013): 102–103. “Now I Was Free,” The Trumpet 2, no. 2 (May 2012): 80–81. “Clinton,” The Trumpet 2, no. 1 (January 2012): 49. “Auburndale,” The Trumpet 1, no. 2 (June 2011): 21. Readux. Open source digital platform display, annotate, and export digitized books. Lead developer, version 1, Rebecca Koeser. Lead developer, version 2, Jay Varner. Product manager, version 1, Sara Palmer. Product owner, version 2, Jesse P. Karlsberg. Version 1.8, August 2017; Version 2.0, expected April 2019. FaSoLa Minutes. iOS and Android application enabling users to read, search, and interpret minutes recording the proceedings of Sacred Harp singings taken from 1995–present. Programmed by Mark Godfrey and Mike Richards. Designed by Lauren Bock. Project manager, Jesse P. Karlsberg. Version 1.0, 2013; Version 2.0, 2015.
Review: Clarissa Fetrow, “There’s an App for That: A Review of the ‘FaSoLa Minutes’ App,” Sacred Harp Publishing Company Newsletter 3, no. 2 (November 12, 2014). Analysis: David Brodeur and David Smead, “Entropy Unpacked: The Entropy Number from ‘FaSoLa Minutes,’” Sacred Harp Publishing Company Newsletter 5, no. 1 (August 22, 2016). Songs of the Sacred Harp. Half-hour BBC Radio 4 documentary on Sacred Harp singing’s history and recent spread to Europe. Narrated by Cerys Matthews. Produced and edited by Joby Waldman. Main interview subject and historical advisor, Jesse P. Karlsberg. 2013. New Compositions in the Style of The Sacred Harp. Web site featuring new tunes, written in the styles of The Sacred Harp, by composers from the United States and the United Kingdom. Programmed, designed, and edited by Jesse P. Karlsberg. 2007–present. Review of African American Folksong and American Cultural Politics: The Lawrence Gellert Story, by Bruce M. Conforth, Society for American Music Bulletin 42, no. 1 (Winter 2016).